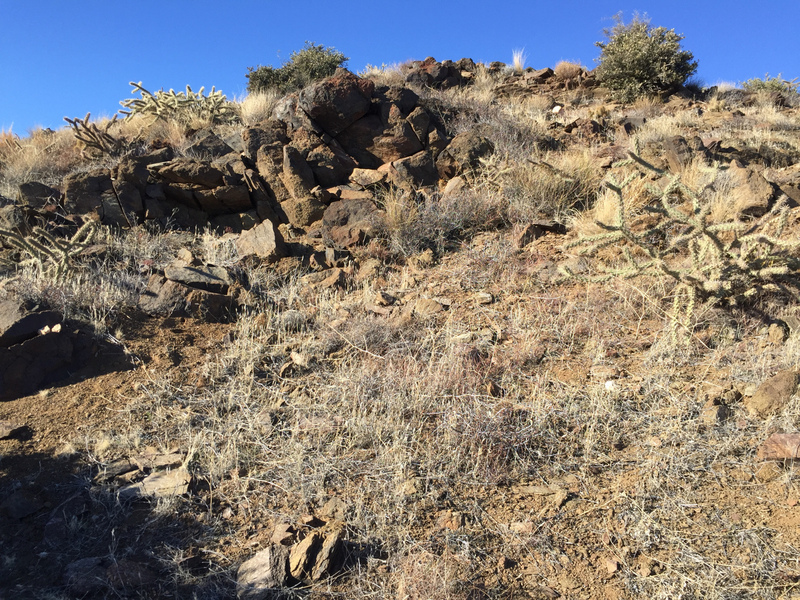 This is technically another look-only locality, as these rocks are located within the McDowell Sonoran Preserve. It's a bit of a hike to get to the outcrops, but you'll be rewarded with spectacular views. Definitely worth a visit. 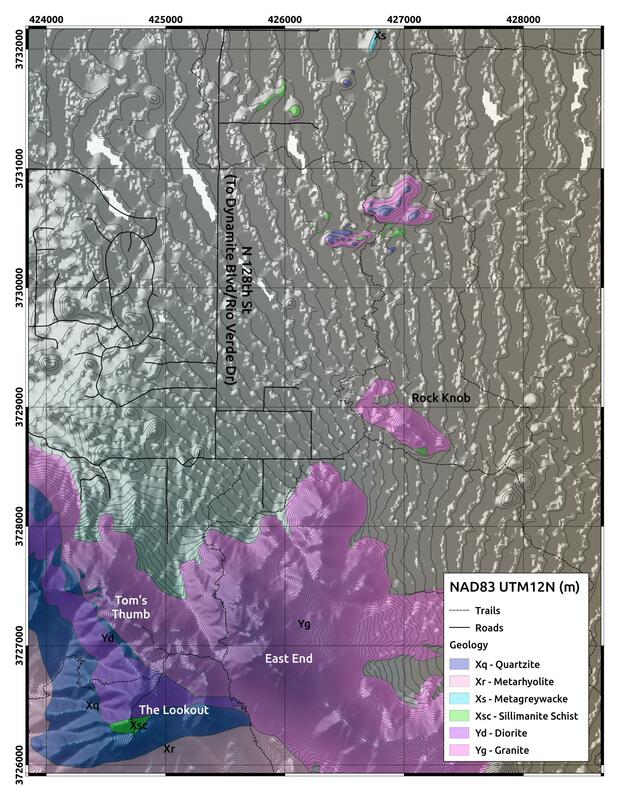 At this locality, you'll be able to see examples of a very old sillimanite schist (denoted by the green Xsc region in the geologic map below). 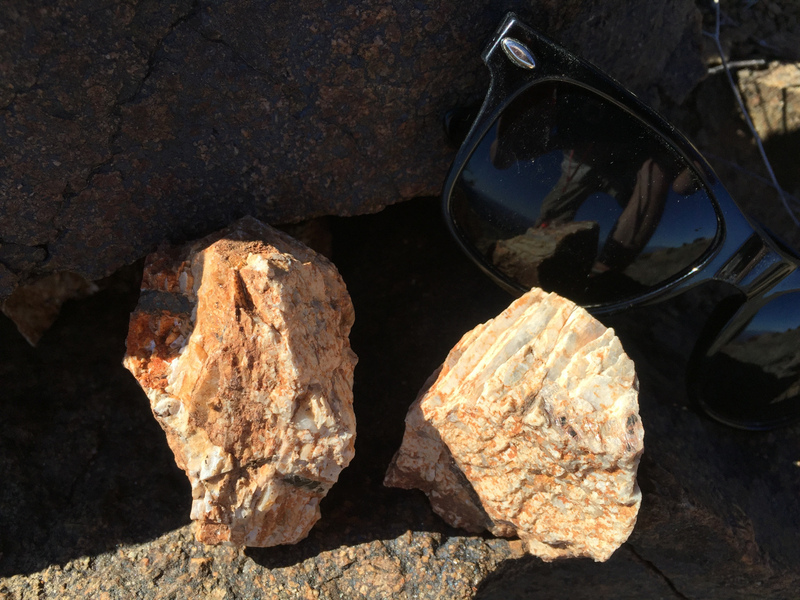 While the sillimanite crystals have been pretty badly weathered, the rocks nevertheless tells us some very interesting things about the geologic evolution of this part of Arizona. Sillimanite only forms at high temperatures (> 600° C) and high pressures (> 0.4 GPa, which corresponds to depths of roughly 15 km), so its presence indicates that these rocks were at some point subjected to those conditions. 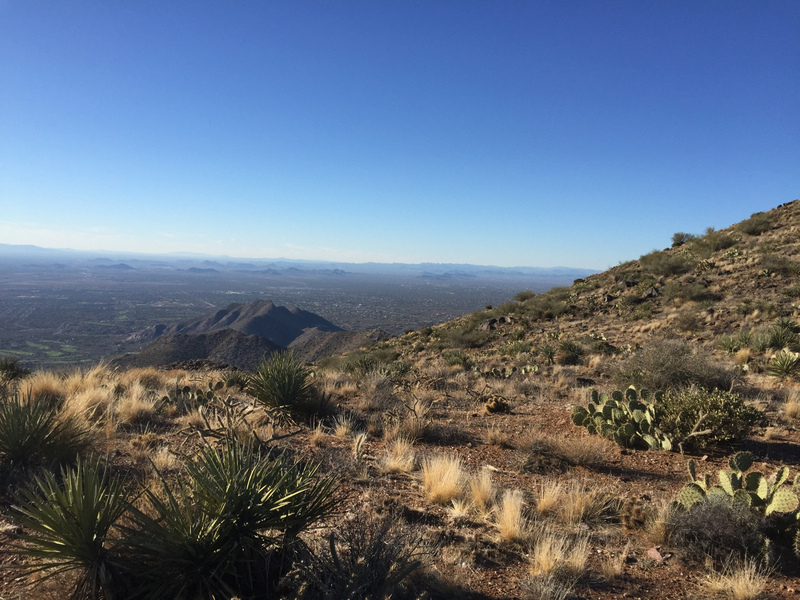 To get to the metamorphic rocks that include the sillimanite schist, you'll take the Tom's Thumb Trail to the spur trail that leads to The Lookout, which is a spectacular promontory from which to gain great views to the west, east, and north. On your way to The Lookout, you'll hike through 1.4 billion-year-old granite (this rock forms Tom's Thumb, which is worth a visit since you'll be in the area). 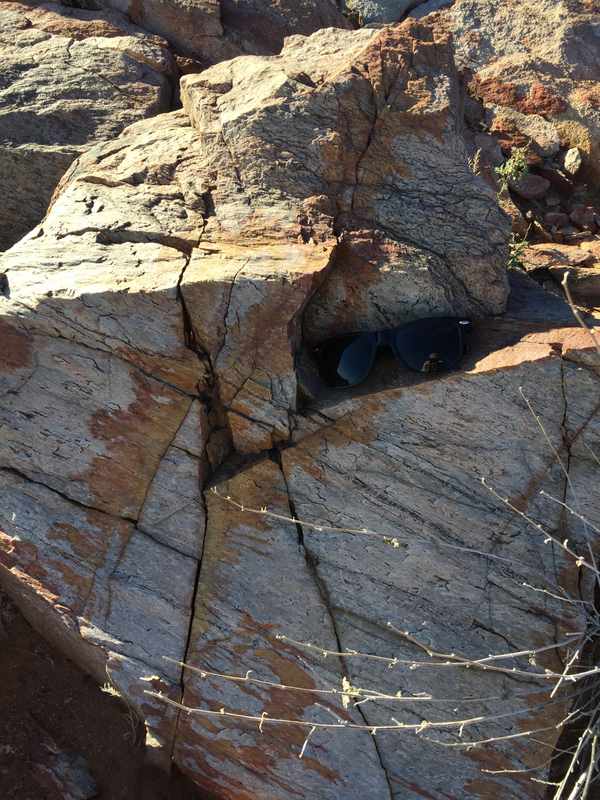 The sillimanite crystals could have formed during the original formation of these metamorphic rocks during assembly of this part of Arizona between 1.8 and 1.6 billion years ago, or the sillimanite could have developed within these rocks during the emplacement of this 1.4 billion-year-old granite. 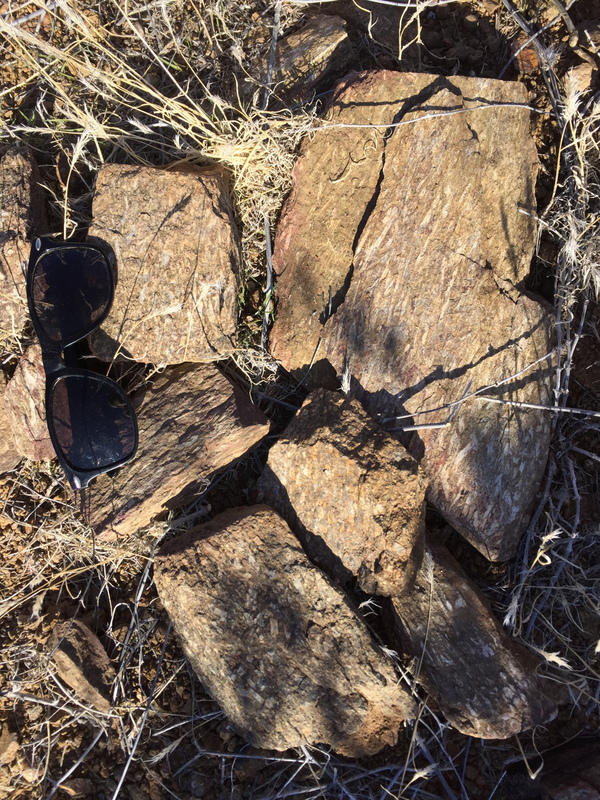 Either way, these rocks were likely exhumed from more than 15 km depth to their current position within the last 20 million years or so due to the onset of Basin and Range extension. Once you get to the turn-off for The Lookout, notice how you're heading from very rocky, irregular terrane to generally smoother, less jagged terrane. This difference is a geomorphic expression of the differences in the two major rock types of this area: the granite that you just passed through does not erode as easily and therefore forms blocks and boulders, whereas the metamorphic rocks that host the sillimanite schist erode much more easily. 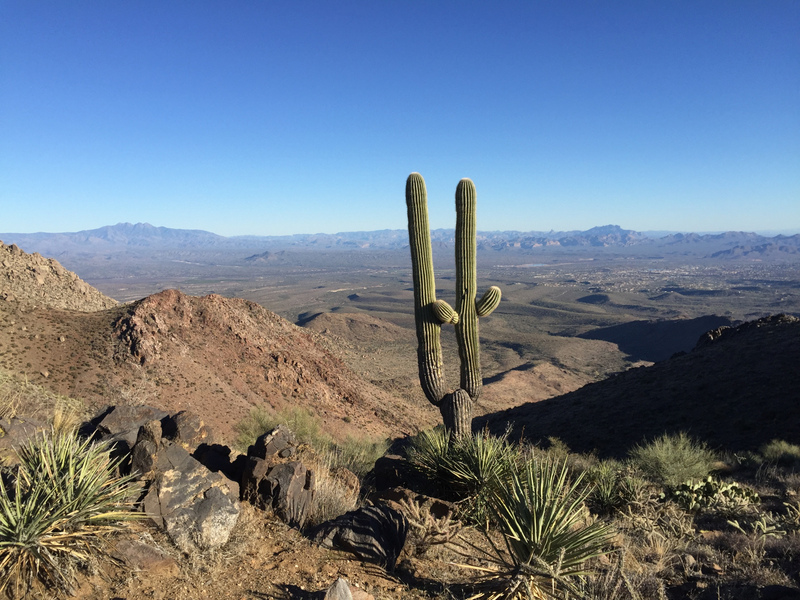 At The Lookout, you will be able to see west into Phoenix; north to Lake Pleasant, the Bradshaw Mountains, and the Mazatzal Mountains; and east to the Four Peaks and the Superstition Mountains. You'll be able to see Weaver's Needle sticking up to the southeast. The first pair of coordinates given above was taken at a good outcrop of the sillimanite schist, which is slightly off of the spur trail. 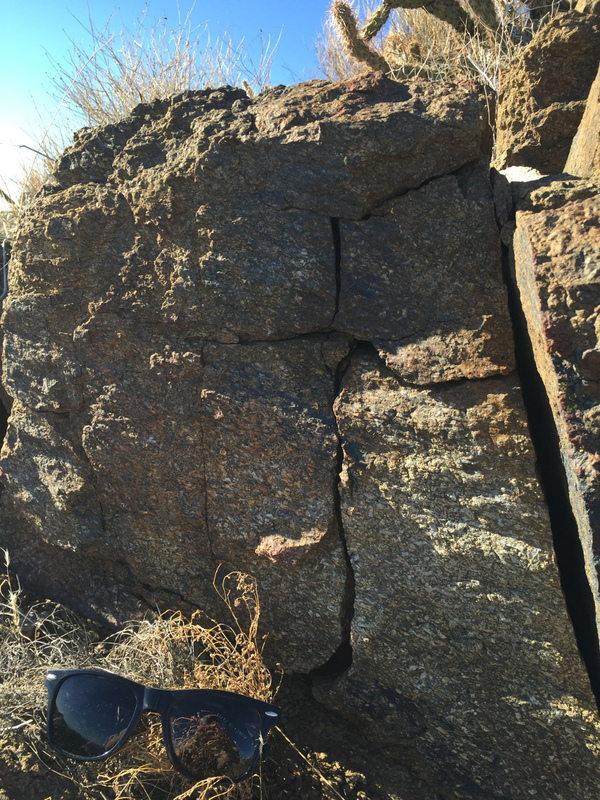 The second set of coordinates was taken where the trail intersects the sillimanite schist body. The sillimanite appears as white blades up to several centimeters in length within a dark brownish green foliated rock. The sillimanite crystals are badly weathered, but they are abundant. Keep an eye out for small graphic granite bodies hosted within the metamorphic rocks. (Graphic granite is characterized by its unique texture that is made of long, parallel rods of quartz and feldspar.) The spur trail ends at an outcrop of quartzite, which displays an interesting stretched texture suggestive of shearing. I would not recommend approaching the Tom's Thumb Trailhead from Dynamite Blvd. and 128th St., as 128th St. is not entirely paved. Instead, I recommend taking Happy Valley Rd. and Ranch Gate Rd.